« BibleNewsProphecy: Are Investors Facing The Four Horsemen Of The Apocalypse? “We’ll have to develop those weapons, unless Russia comes to us and China comes to us and they all come to us and say let’s really get smart and let’s none of us develop those weapons, but if Russia’s doing it and if China’s doing it, and we’re adhering to the agreement, that’s unacceptable,”’ he said. But Ryabkov denied Trump’s accusations, throwing the accusation back at Washington. The administration of former President Barack Obama worked to persuade Moscow to respect the INF treaty but made little progress. Russia has responded to Washington’s impending withdrawal from the arms treaty by accusing it of striving to become the world’s only superpower. Russian Senator Alexei Pushkov took to Twitter to condemn the move as “the second powerful blow against the whole system of strategic stability in the world,” with the first being Washington’s 2001 withdrawal from the Anti-Ballistic Missile treaty. Deputy Foreign Minister Sergei Ryabkov told the TASS state news agency that Trump’s planned move was dangerous. “This would be a very dangerous step that, I’m sure, not only will not be comprehended by the international community but will provoke serious condemnation,” Russia’s Deputy Foreign Minister Sergei Ryabkov said. 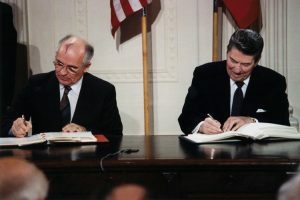 The treaty is “significant for international security and security in the sphere of nuclear arms, for the maintenance of strategic stability,” he told state news agency Tass. Mr Ryabkov said Russia condemned US attempts to gain concessions “through a method of blackmail”. The minister also told the news agency RIA Novosti that if the US continues to behave “clumsily and crudely” and backs out of international agreements, “then we will have no choice but to undertake retaliatory measures, including involving military technology”. MOSCOW (AP) — President Vladimir Putin hailed new missiles in Russia’s military arsenals but emphasized Thursday that the country would only use its nuclear weapons in response to an incoming missile attack. So, once again, we see that the Brits are supporting the USA and the Germans are not doing so. Thia is consistent with biblical prophecies. Now, unless the Russians give/sell one of the ‘Satan 2’ missiles to the Europeans–or otherwise support European efforts–I do not believe it will ever be used to destroy Texas. Yet, despite temporary support of the EU by Russia, it is possible that something like this could be used one day to eliminate parts of Europe, such as France (see also The ‘Lost Tribe’ of Reuben: France in Prophecy?). Ezekiel 38 is for the distant future–and right at/after the millennium (cf. Revelation 20:7-9; see also Ezekiel 38: For Russia & Iran in Our Day? ; a related video is also available titled Ezekiel 38: For Russia, Ukraine, & Iran Now?). The Bible is clear that Russia will be a significant military power in the end and cause fear (Daniel 11:44-45; Jeremiah 50:41-43; again to see more details, see Russia and Ukraine: Their Origins and Prophesied Future). US President Trump has, once again, given the Germans and Russians impetus to speak to each other on military matters where they oppose the USA. The USA is pushing Europe (including Germany) towards Russia. A deal between Europe and Russia will happen and it will NOT end well for the USA (Daniel 11:39) nor for its Anglo-Saxon descended allies (Daniel 8:24-25). This entry was posted on Sunday, October 21st, 2018 at 7:20 am	and is filed under Prophecy.